Puran Defrag is the free defrag utility from Puran Software, the same developers of Puran File Recovery, one of my favorite free data recovery tools. You're able to use Puran Defrag to defragment multiple hard drives when your computer goes idle. Advanced scheduling options are also available like defragging just free space or prioritizing your files for quicker access. 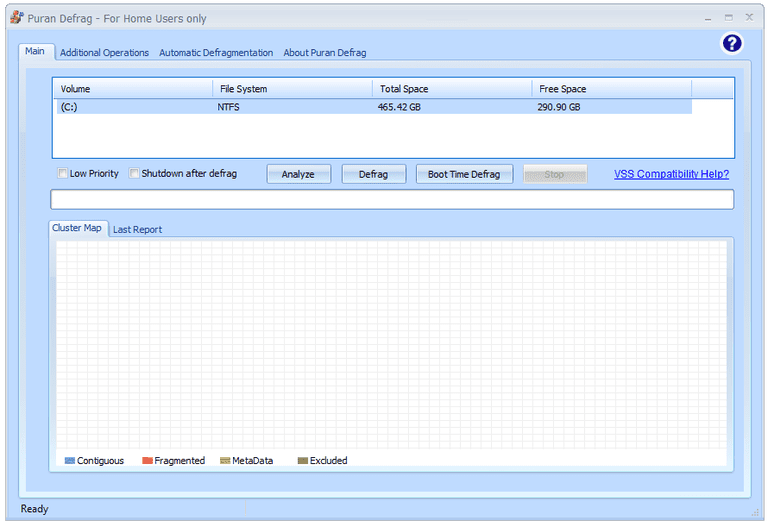 This review is of Puran Defrag version 7.7.1, released on June 15, 2016. Please let me know if there's a newer version I need to review. I really like the scheduling options in Puran Defrag. As I said above, you can schedule a boot-time defrag and a regular disk defrag. A schedule can be created not only for the hard drive that has Windows installed, but also any attached ones, like USB drives. Fill Gaps: This is what Puran Defrag calls a regular defrag, where gaps that are found on a disk will be gathered together into a continuous block, thus reducing fragmentation and speeding up disk access. Optimize Directories: NTFS drives can have their folders moved to the quicker part of a disk so they are able to be accessed faster than files. Because most people open folders before they open files, and thus open more folders than files, this option can help speed of directory access. Free Space: As I mentioned above, only a scheduled process can run a defrag against free space on a drive. This option only works for the drive that Windows is installed to. Fast PIOZR: The most commonly used files are moved to the faster part of the disk if this option is chosen. This is a bit like the Optimize Directories option but includes files instead of folders. Exclude Files: When checked, this option will activate the list of files you've chosen to exclude from a defrag via the Additional Operations screen in Puran Defrag. Delete Files: Similar to the previous setting, when selected, the list of files that are chosen to be removed during a defrag (from the Additional Operations screen) will be deleted. Exclude Files (by size): Enter a minimum and maximum size in megabytes to exclude files from a defrag that match that criteria. As is probably obvious, I really like the scheduling function in Puran Defrag; it's very detailed and great for skipping things you don't wish to defrag. For a defrag program to include idle scanning as an option is definitely appreciated. I find this particular feature very useful for those of us that wish not to have memory and CPU degradation during a disk defrag. Something I found not so beneficial is the results page after an analysis is run. You have to scroll through the results and read them in text form to see how much of a drive is fragmented, which is definitely different than the easily-readable summarized results found in Defraggler. Also, the results only show the top ten fragmented files, whereas programs like Smart Defrag show you every single file on the drive that contains fragments. During setup, Puran Defrag does the common, yet annoying, task of trying to install another program along with it. You can easily bypass this with the Decline button. Something else that keeps me at a distance with Puran Defrag is simply that it doesn't look very appealing. The options seem to be oddly positioned and just not very inviting when I use it. Overall, when considering features such as boot time and idle defragmenting, advanced scheduling, and context-menu integration, Puran Defrag turns out to be a fine program.